Audio PDF Available for immediate download. You can listen to this Ebook on your smartphone, laptop, Ipad, or computer. 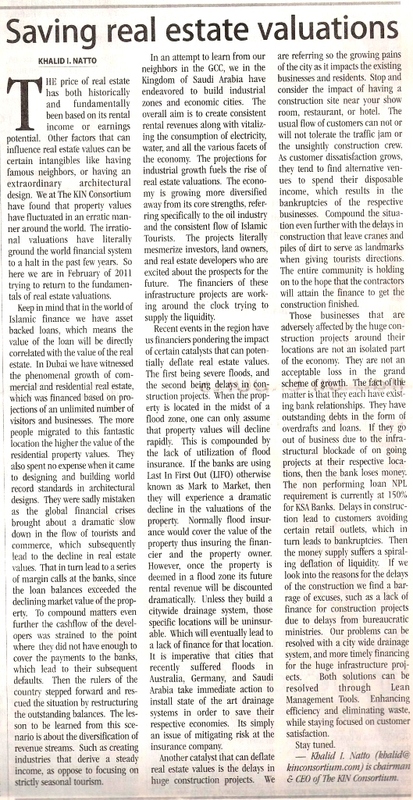 The Saudi Gazette Article "Changing landscape"
Research Reports and Valuation Models in the Kingdom of Saudi Arabia & the Middle East & North Africa (MENA). As discussed in our recent video, the foreign investors have arrived. July 23rd, 2011 We at The KIN Consortium have recently produced Android Applications, published dozens of articles, economic research reports, videos, and new web pages announcing a new product to stimulate local businesses like restaurants, hotels, golf courses, auto dealers, and we are considering taking on museums. Join us if you want to make some money vitalizing your local community. "July 12th, 2011 : We built and launched our sixth Android Application for the "ALJ Android Application" in the Kingdom of Saudi Arabia. IF YOU USE GOOGLE ANDROID FEEL FREE TO DOWNLOAD the "ALJ Android Application" developed by The KIN Consortium." "July 7th, 2011 : We built and launched our fifth Android Application for the "On The Border MExican Grill & Cantina" in the city of Jeddah, Kingdom of Saudi Arabia. IF YOU USE GOOGLE ANDROID FEEL FREE TO DOWNLOAD the "On The Border MExican Grill & Cantina" developed by The KIN Consortium." 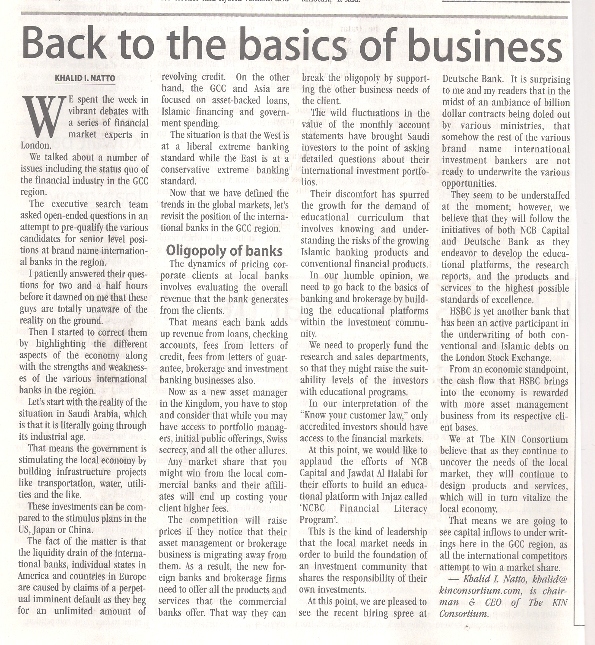 "July 7th, 2011 Arab News Article: Restaurant industry — a fruitful business"
This week we have decided to discuss the restaurant industry, simply because it’s one of the most consistently profitable sectors of the economy. We at The KIN Consortium have researched a variety of sources and we found a report that was recently published in 2011 that was entitled, “NCB Saudi Economic Perspectives.” The restaurant industry took a dramatic hit in 2009, and recovered somewhat in 2010. According to the SAMA (Saudi Arabian Monetary Agency) and NCB forecasts, the restaurant industry should have fully recovered by the end of 2011. Keep in mind that restaurants are one of the key sources of entertainment in the Kingdom. We are blessed in the Kingdom because the markets are full of fruits, vegetables, and spices from all over the world. It’s an absolute delight for both restaurant chefs and restaurant patrons. If you select the right restaurants, you can literally experience the cuisine and ambiance of almost every culture on the planet. There are literally elegant restaurants and fast food chains from almost every part of the world. The only question is the long-term survival of each restaurant in a market that has a customer base with whimsical taste buds — also in a market that is saturated with a variety of competing theme restaurants. "July 5th, 2011 : New Video describing the latest two Android applications." "July 2nd, 2011 : We built and launched our fourth Android Application for the "Elia Restaurant" in the city of Dubai in the UAE. IF YOU USE GOOGLE ANDROID FEEL FREE TO DOWNLOAD the "Elia Restaurant" developed by The KIN Consortium." 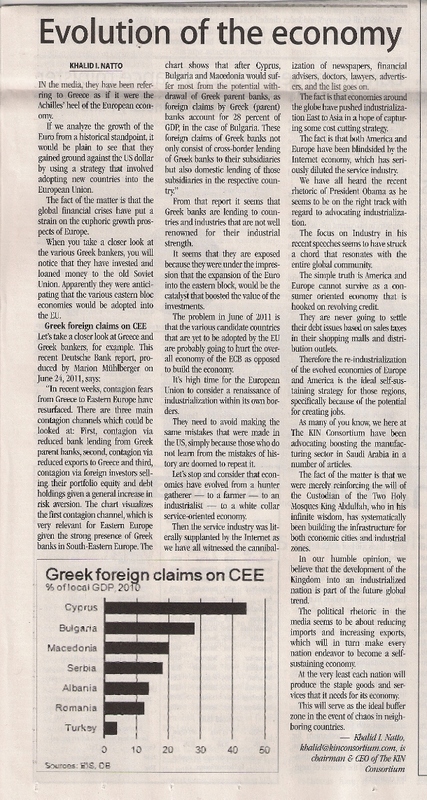 In the media, they have been referring to Greece as if it were the Achilles’ heel of the European economy. If we analyze the growth of the Euro from a historical standpoint, it would be plain to see that they gained ground against the US dollar by using a strategy that involved adopting new countries into the European Union. The fact of the matter is that the global financial crises have put a strain on the euphoric growth prospects of Europe. When you take a closer look at the various Greek bankers, you will notice that they have invested and loaned money to the old Soviet Union. Apparently they were anticipating that the various eastern bloc economies would be adopted into the EU. "June 30th, 2011 : We built and launched our third Android Application for the "Candy Bouquet" in the Kingdom of Saudi Arabia. IF YOU USE GOOGLE ANDROID FEEL FREE TO DOWNLOAD the "Candy Bouquet Android Application" developed by The KIN Consortium." "June 19th, 2011 : We built and launched our second Android Application for the Hilton Hotels in the Kingdom of Saudi Arabia. IF YOU USE GOOGLE ANDROID FEEL FREE TO DOWNLOAD the "Hilton Hotel Android Application" developed by The KIN Consortium." "June 19th, 2011 : We built and launched the first "The KIN Consortium" Android Application for smart phones. Its complete with links to videos, articles, and I put in some poems that if tapped they will play an audio files of Chairman Natto reading the poems." This week we witnessed a scene that accurately depicted market sentiment. All newspapers and media outlets had images of perfectly good-looking fruits and vegetables being cast into piles of garbage. We spent the week in vibrant debates with a series of financial market experts in London. We talked about a number of issues including the status quo of the financial industry in the GCC region. The executive search team asked open-ended questions in an attempt to pre-qualify the various candidates for senior level positions at brand name international banks in the region. I patiently answered their questions for two and a half hours before it dawned on me that these guys are totally unaware of the reality on the ground. Then I started to correct them by highlighting the different aspects of the economy along with the strengths and weaknesses of the various international banks in the region. Let’s start with the reality of the situation in Saudi Arabia, which is that it is literally going through its industrial age. At any given moment countries have three choices of growth, bankruptcy, or refinancing debt The alternatives are simply that things can go up, they can go down, or they can stay the same. In the Kingdom of Saudi Arabia we have witnessed a growing trend that seems to follow the same game plan of a number of countries and states. The game plan is to build commercial and residential locations that will consume utilities. The idea is then to market the locations in a way where a huge number of people would come to rent and pay the utility bills. It's an excellent plan at first glance because it is ideal for all sorts of investors ranging from both Islamic to conventional forms of finance. Lets take a moment to define and analyze the strategy in a variety of locations around the globe. 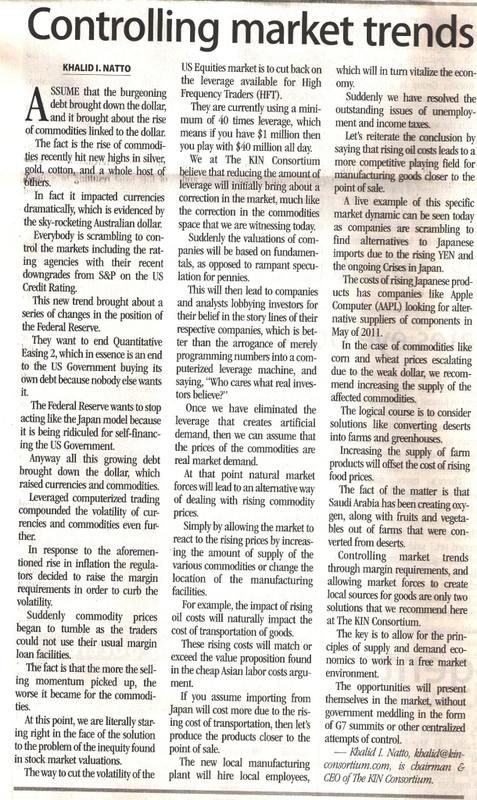 "May 12th, 2011 Arab News Article: Controlling Market Trends"
Apple Computer crashed for a split second at 10:51 AM. We reached out to investors, students, SEC, and the media to get it corrected. Reuters published later that the incident was corrected at the BATS exchange. THE anniversary of the May 6th “Flash Crash” is coming up soon. We at The KIN Consortium are excited to hear about the changes in the markets and exchanges since that day of devastating losses. The free markets stood back in awe as companies suddenly traded at or near zero dollars per share. It all happened in a matter of seconds, but the lasting ramifications is evidenced by the ruined confidence in the market place in terms of real human investors. The culprit was a high frequency trading tactic called, “Quote Stuffing,” which occurs when a trader places a bid of zero while placing an asking price of a 1,000,000. The idea behind this tactic was to slow down the extremely fast leveraged computers that were buying and selling faster than the human traders could place the order in the markets. On that horrible day the various traders overwhelmed the system with quote stuffing orders, until the stock prices fell too zero. The market reaction was full of shocked reporters, investors, and company owners. The exchanges and the various regulators went to work spinning up new rules that would surely prevent such a calamity from happening again. I think they missed the point entirely. We apparently have our finger on the pulse of international financial markets. 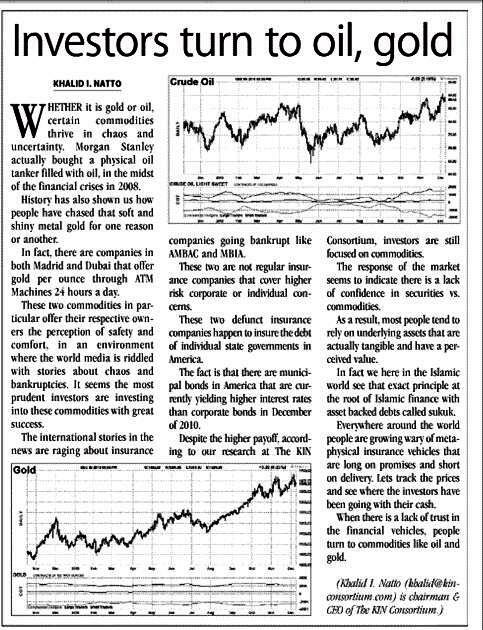 On December 16, 2010, we published an article discussing alternatives to debts and equities — like oil and gold. The Efficient Market Hypothesis (EMH) is the principle that’s holding the feet of the traders to the fire of Fair Market Value (FMV), because the news is full of pending doom in the earnings reports and conference calls. 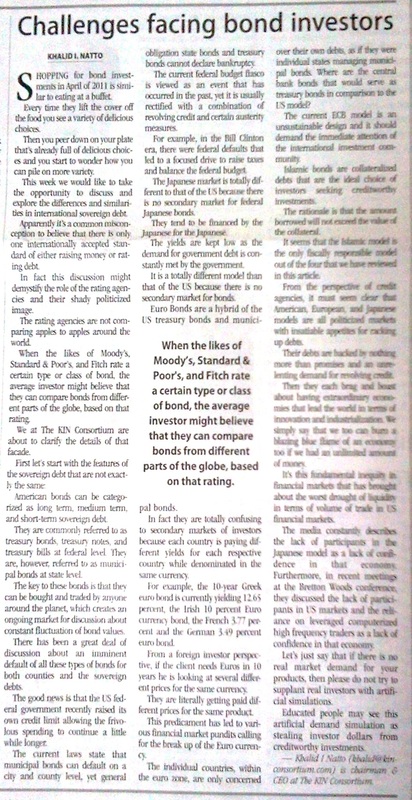 "March 24th, 2011 CNN Article: Trading Stocks on my Samsung Galaxy Tab"
"Click here for the Option strategies Videos & Powerpoints"
March 24th, 2011 Arab News Article: Manufacturing in the KSA! By KHALID I. NATTO Published: Mar 24, 2011 00:45 Updated: Mar 24, 2011 00:45 We are living in some exciting times with all that's going on in the news. I am talking specifically about Japan and the earthquakes, exploding nuclear reactors, electricity blackouts, volcanoes, tidal waves, mass evacuations of Tokyo, mass destruction, closing of manufacturing plants, and the chaos of the financial markets. We recently discussed the ramifications of the chaos on the insurability of Tokyo based businesses in a video on our website at http://www.kinconsortium.com. 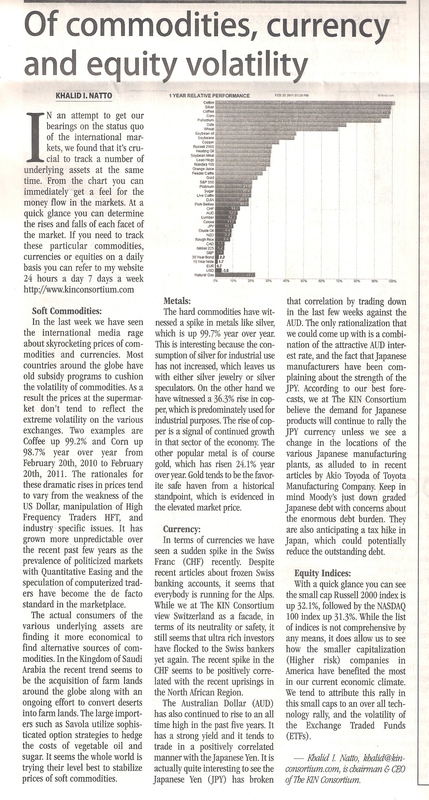 The fact is that Japanese businesses have been suffering from the rising Japanese yen (JPY). This problem has been compounded by rising insurance premiums, which is hindering the profitability of the various Japanese manufacturers. The visionary leader Toyoda is the CEO of Toyota Manufacturing Company actually mentioned in an interview recently that he was open to considering changing the location of his manufacturing facilities if the yen continued to rise. I am earnestly waiting for his next public statements regarding the impact of Insurance premiums on the bottom line of his income statements. There are obviously a number of locations across the globe that are going to be aggressively lobbying the various manufacturers for their investments, yet from our analysis we would like to highlight the advantages of the Kingdom of Saudi Arabia. 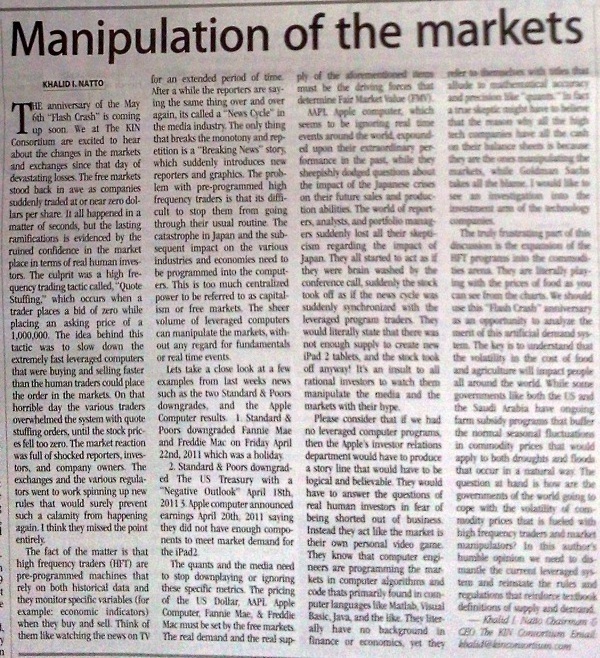 March 10th, 2011 Arab News Article: Is KSA the land of opportunity? In the recent past, we have published a plethora of reasons why it is fundamentally unsound to ignore credit analysis in favor of loan guarantees like the CDS. Let's take the opportunity to discuss the respective rates of the various countries involved in a crises in North Africa. The loan insurance rates (CDS) for Egypt are literally flying as a result of the chaos. All the various concepts of automation were first introduced in the industrial sector. Now they are being applied to the financial services sector. It made more sense in the industrial sector since we were dealing with the automation of tangibles. The creation of cars through robots would allow for less defects, faster and continuous production, less cost of labor and labor related accidents. The quality control of the product can be quantified statistically and the process can be adjusted to attain a perfect balance between the cost of goods produced and the highest quality standards. It leads to protocols and books that discuss statistical analysis for monitoring any process, such as Six Sigma, The Toyota Way and Lean. It’s gotten to a point that the cheapness of Asian labor argument has been deemed obsolete since everything is automated. If robots produce all cars then we should be able to produce the cars anywhere. Thus we at The KIN Consortium are supporters of the automation of the industrial sector, since it is our drive and motivation to industrialize Saudi Arabia. Modern day economics is not a far cry from the days of Adam Smith. In his book the "Wealth of Nations" he discusses issues like competitive advantage, the freedom of the movement within the economy, and how market prices would be set by supply and demand. Today we have the same age-old struggle of manipulation in the markets hindering the price discovery process. 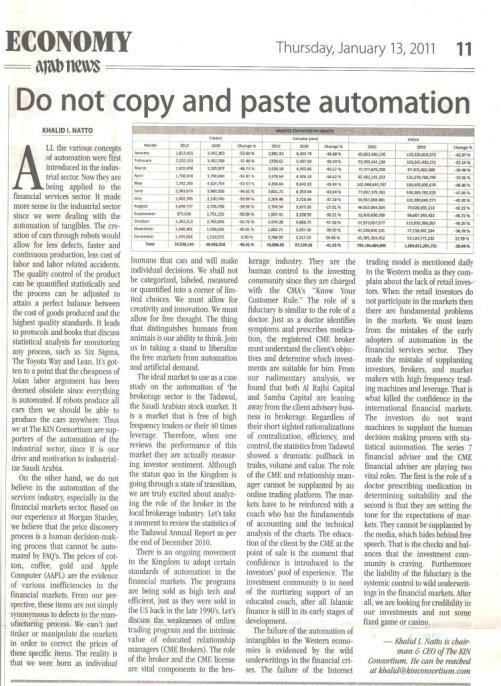 In this article we are going to discuss natural demand and the efficiency of manufacturers who respond to the market, and we are also going to discuss artificial demand and the inefficiency of investing in the manufacturing of products that have no natural market demand. It is amazing how the sheer implication of a government subsidy can open the doors to the financial markets. Let us take a look at the automobile sector and the solar industry sector for the sake of our discussion. During the recent financial crises in 2008, the belief systems of the investors and the markets were put to a test. Brand names that were synonymous with quality and safety were suddenly shunned as counterfeit or fake. Companies like Lehman Brothers disappeared, and GM declared bankruptcy. The ramifications reached old customers, new customers, spare part suppliers, employees, retirees, shareholders and the list goes on. The survival of the brand names came down to a series of fundamental questions. What is real? What does the secondary market believe about your brand name? In other words, does GM have a good reputation and corporate identity overseas? Was the brand name incorporated as a part of local cultures? I remember being a young banker at Banque Saudi Fransi back in 1995. I had just completed my first year training program, and I was in line for a career with a well-established bank in Saudi Arabia. Then I came upon a moment that changed my destiny. My supervisor got promoted to Switzerland; he was going to become a "Swiss Banker". The local French manager gathered all the corporate and commercial bankers into the hallway, as he handed my supervisor a box of cigars and a leather pouch. The Frenchman then proclaimed that he was "A Real Banker", as he smiled and looked over the rest of us Saudi bankers with disdain. That was the pivotal moment in my career. That’s when I decided that I would endeavor to be the best of the best. Armed with my desire and self-esteem, I took my savings of $25,000, packed my clothes and I was off to America. Saudi Arabia is world renowned for being the center of spiritual healing with the presence of the two cities of Makkah and Madinah. However, the current trend in investing in medical science is very interesting. It is an incredible vision that combines both faith and science. The state of the art medical facilities currently being discussed in Madinah at the Knowledge Economic City is said to be an environment that parallels the city's ambiance of both serenity and spirituality. Relaxation for the mind, body and soul is offered to accelerate healing. Its an exciting time in the Financial Markets of the Middle East, as we close out the first decade with deals that can only spur the financial industry forward. Islamic Banking has become the chosen means of finance not only with Islamic Companies, but obviously by multinational corporations like Total. Rest assured, based on the research that we have undertaken at The KIN Consortium, 2011 is going to be an extra ordinary year. Both the IPO Pipeline and Sukuk Pipeline are growing daily. We are keeping a vigilant watch over the New Projects that are vying for the facilities offered by Islamic Finance. We are living in interesting times. Status Quo: We have the US Treasury committing the same crime that it has accused the Chinese of doing. In our example of Quantitative Easing QE2 is literally currency manipulation and government intervention. While we sit back and watch the Chinese struggle with the mind bending hypocritical logic of our times, the free market capitalist finds comfort in his realization that the IMF is working on alternatives like the Special Drawing Rights (SDR). While its still in its early stages of discussion, its comforting to see that they have recognized the systemic problems of the Bretton Woods Agreement. Finally we would like to reiterate that it is the firm belief of The KIN Consortium that the concept of Loan Insurance on any level be it corporate, State, or Federal should be illegal. It has no place in banking or the financial markets. 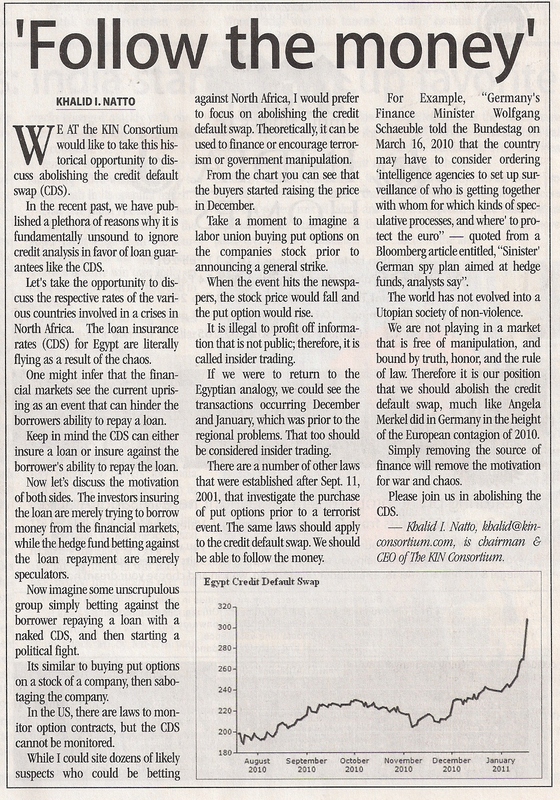 We wholeheartedly support the courageous and controversial move of the Government of Germany in the outlawing of the Credit Default Swap (CDS). 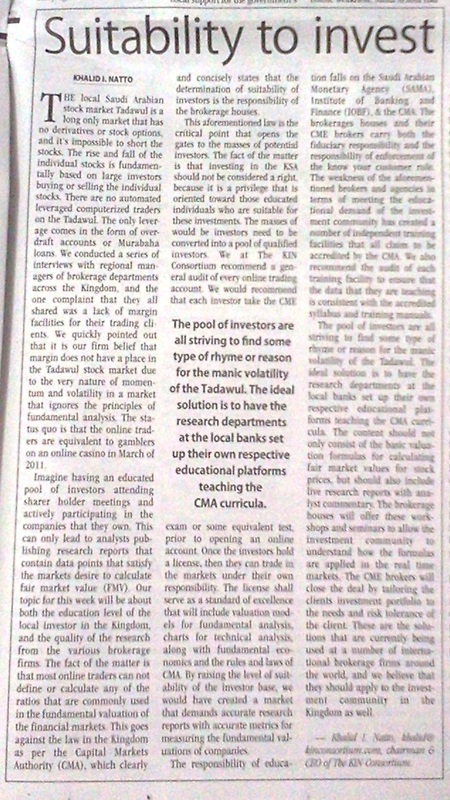 Its High Time for an honest review of balance sheets for fair market value. The shining example of traditional banking is Islamic Banking, which is asset backed loans. If we use that as our fulcrum, we can easily see how Western economies are see sawing with their metaphysical insurance guarantees, and their imminent bankruptcy. 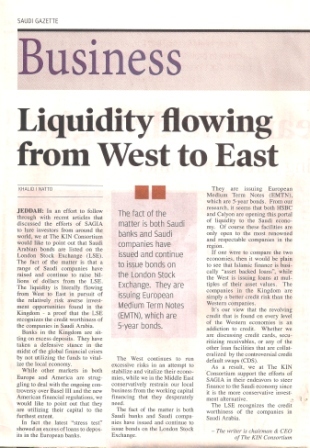 The Saudi Gazette Article "Liquidity Flows from West to East" The fact of the matter is both Saudi banks and Saudi Companies have issued and continue to issue bonds on the London Stock Exchange. They are issuing Euro Medium Term Notes (EMTN ), which are 5 year bonds. 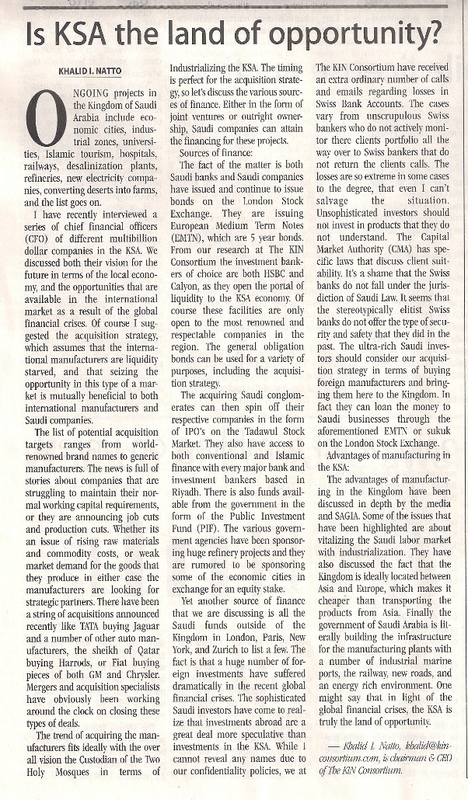 From our research it seems that both HSBC and Calyon are opening this portal of liquidity to the KSA Economy. Of course these facilities are only open to the most renowned and respectable companies in the region. New Audio PDF's On Amazon . com Audio PDF Available for immediate download. You can listen to this Ebook on your smartphone, laptop, Ipad, or computer. October 15th, 2010: Audio PDF Available for immediate download. You can listen to this Ebook on your smartphone, laptop, Ipad, or computer. The response in the Kingdom of Saudi Arabia is the reinvigorating of the Saudi Agriculture Agenda. Everything from Govt. 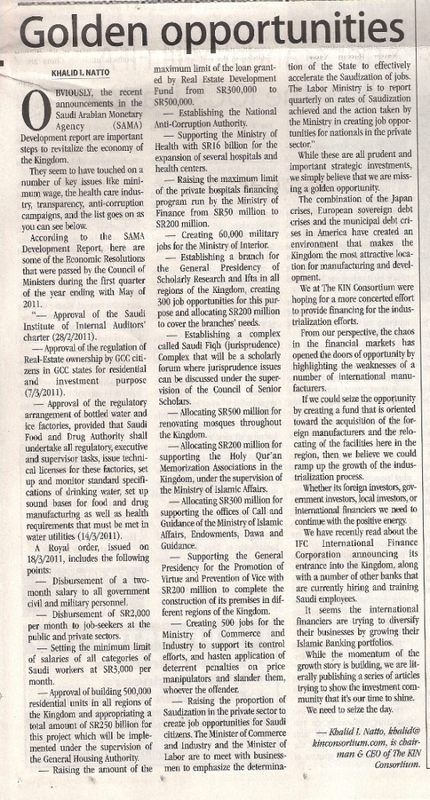 financing via the Ministry of Finance and the Agriculture Development Fund to the Saudi Agriculture Expo for 2010. The Expo will feature a NEW Economic City named the Prince Abdul-Aziz Mousaed Economic City which will be located near Hail. This initiative serves a variety of purposes beginning with the stabilization of commodity prices, and ending with cooling the planet by converting barren desert lands into farms. We are experiencing bold new changes in the Kingdom of Saudi Arabia with meticulous planning and targeted Government investments. This Agriculture Expo will serve as a beacon to the world of the brilliance of the leadership of the Royal Family of Al Saud. August 31st, 2010: "(Updated with Charts) Algorithmic Trading and Artificial Demand"
May 21st, 2010: "Algorithmic Trading and Artificial Demand"
May 4th, 2010: "Europe Abandons the Rating Agencies"
April 1st, 2010: "The London Stock Exchange is the Beacon of Capitalism"
February 4th, 2010: "We at The KIN Consortium are proud to announce that we have recently developed a technique to stream audio files through a PDF File." 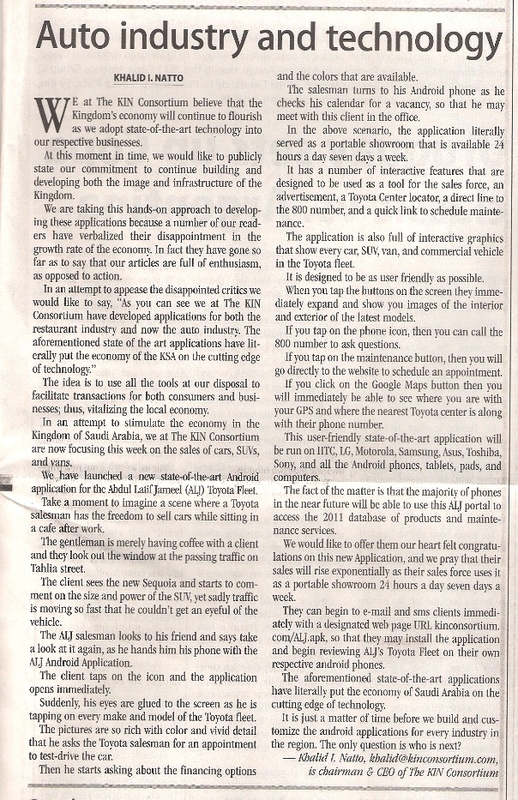 Status Quo Dec. 24th, 2009: "Economic City Case Study" The Economic Cities are Master Developers who derive their revenues from leases and sale of land. They also intend to own a significant percentage of a number of the manufacturers in the Economic Cities (EC). I have interviewed a series of Senior level Managers at three Economic Cities. Their responses were merely an echo of the original Master Plan that was created by Sagia prior to "The Global Financial Crises". There was a tone of innocence in their voices, as they repeated the same rehearsed speeches. They are depending upon the Saudi Govt. loans, foreign direct investment from of manufacturers and tenants, and they firmly believe they deserve unsecuritized term loans. August 15th, 2009 "Technical Charts on the Sectors and Individual Stocks in the Saudi Stock Market Tadawul"
August 3th, 2009 "Profit from Defamation of Character with a Naked CDS"
July 4th, 2009 "Why is it important to Use Option Strategies and Technical Anaylsis in the Volatile Markets in 2009" Discussing Strategies & software programs for charting and order entry. June 15, 2009 "Updated with more Option Strategies and Technical Anaylsis for Serious Investors" Discussing the Short Straddle, Long Call Butterfly, & Long Call Condor Strategies, along with software programs for charting and order entry. June 3rd, 2009 "Structured Products Strategy" The key to this investment strategy is in monitoring the markets with vigilance. May 26, 2009 "Option Strategies and Technical Anaylsis for Serious Investors" Learning to use discipline not emotion, when the fundamentals don't make sense. 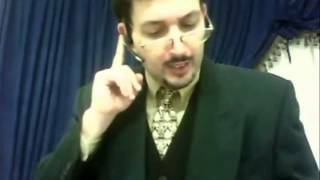 May 25, 2009 "How will the World Change as a result of the SDR?" English and Arabic Comparison of the Pegged Currency and Floating Currency Economies. 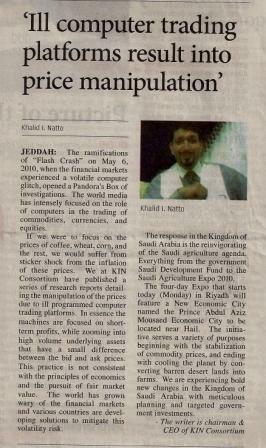 May 15, 2009 "Tadawul The Saudi Arabian Stock Market & Nasdaq Dubai"
As the GCC continues to merge and use the same software platforms and exchanges in America and Europe, it should be easier to attain Fair Market Value for both equities and bonds in the region. 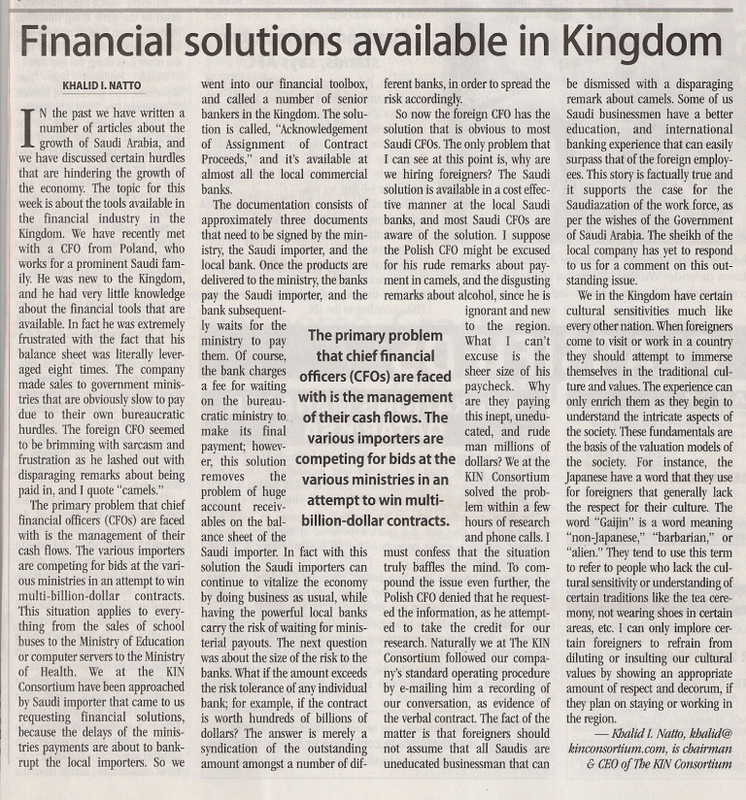 March 1, 2009 "Islamic Financing Is A Viable Alternative To The Chaos in The Financial Markets"
January 29, 2009 "New Accounting Standards RELAUNCHED FOR DAVOS, SWITZERLAND"
It is the position of The KIN Consortium that the system needs checks and balances. In the past Stock brokers were the advocates of the investors. When that position was diluted if not eliminated, there was no internal voice of the investors. The alternative was the internet discussion rooms and emails to the SEC; however, they were largely ignored. The Political power and influence of the UNDERWRITER or Investment Banking Firm would stifle the complaints. Eventually we became faced with .....THE SYSTEMIC FAILURE OF 2008!